Come out for a $15,000 Guarantee and celebrate Fathers Day one day after with a $125 buy-in tournament starting at 11am. Start with 10,000 chips and play 30-minute levels. Late registration is open until 1:15pm. 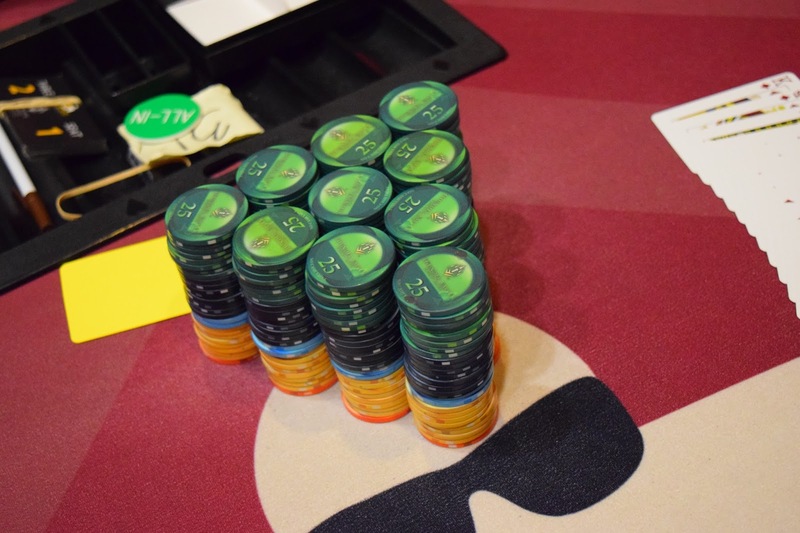 - Here are the final results from the $400 buy-in OneDay$100K with a $100,000 guaranteed prize pool. Kulwant Singh has Bee Lee covered by some, but not a lot of chips here after 14 hours of tournament play, and the two players come to an agreement to shut it down. 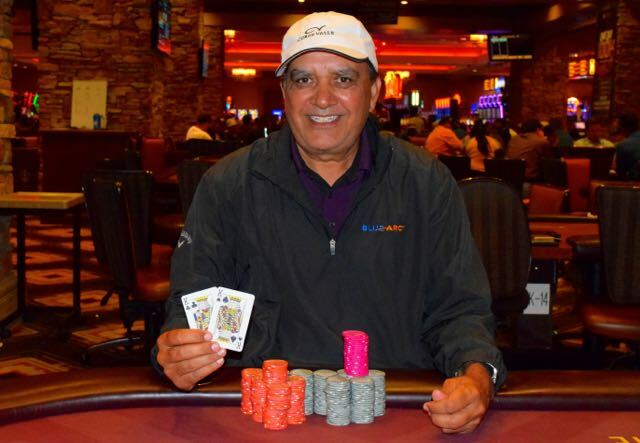 Singh takes $25,000 flat and the title, with Lee taking $21,233 for second place. One hand after losing a 3-way all-in to Bee Lee, Lou Saechao is eliminated by Lee in 3rd place. 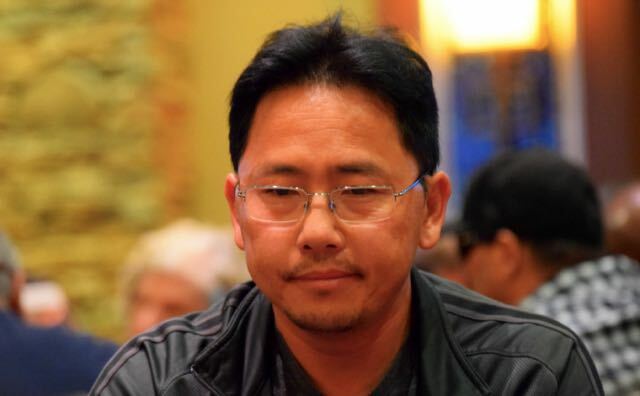 Saechao cashes for $12,236, leaving Lee and Kulwant Singh with almost identical stacks for heads-up play to begin. Lou Saechao leads out for 250,000, Bee Lee shoves for 950,000, Barry Birdwell undershoves for 625,000 and Saechao calls both all-ins. The board runs out 6-3-4-6-3 and Lee scores with a better two pair than the board's, eliminating Birdwell in 4th place. The cards stopped coming and the races went the way of the other players once the final table began for Dan McGee. 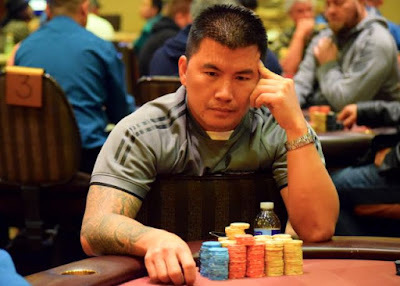 He lost a race on one of the very first FT hands, slid back a bit more, then lost a 2 million pot 88<AQ of Lou Saechao to put fewer than 2BB in front of him. One hand later was teh end of the OneDay$100K for McGee. 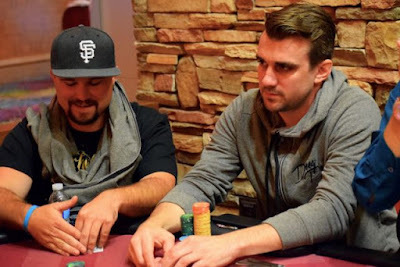 A dominant stack with 15 players left, Dan McGee is down to less than 2BB after racing with 88 against the all-in-preflop AQ of Lou Saechao in a 2 million chip pot. 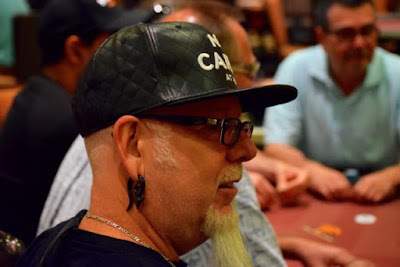 Al Sanchez raises to 260,000 - almost half his stack - and Kulwant Singh moves all in, with Sanchez calling off his 12BB stack. 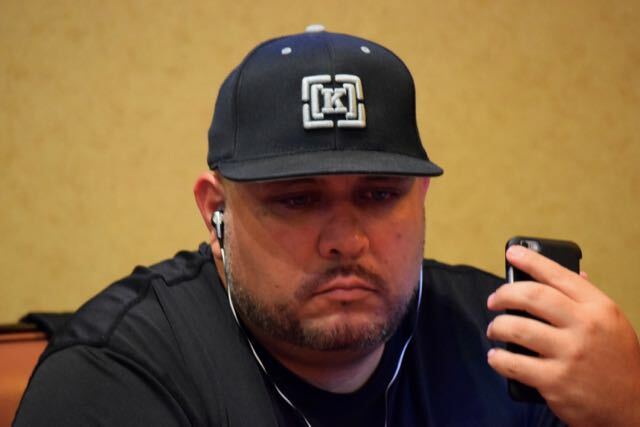 The board runs out T-9-T-3-Q and Sanchez is eliminated in 6th place, cashing for $5,438. Singh, meanwhile, has become the Final Table Eliminator, busting players and chipping up to now have the chiplead with 2.4 million. Up to a milly at the final table, then Debbie Kenoyer ended up twice on the wrong end of hands involving Kulwant Singh. Kenoyer moves all-in for her last 360,000 and Singh makes the call. 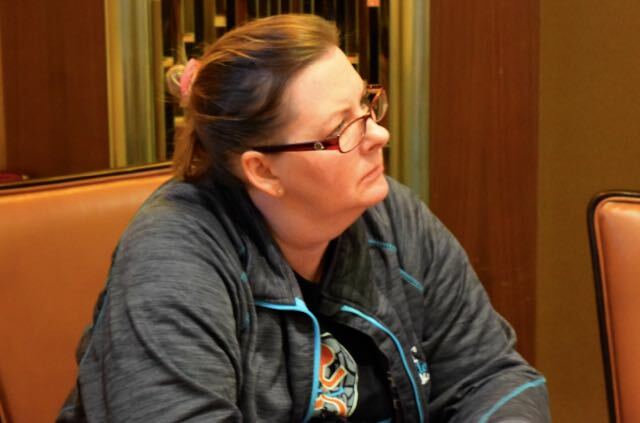 The board runs out without trips or a straight for Kenoyer and she is out in 7th place, cashing for 45 times her $100 satellite entry. Four of the final nine players in today's OneDay$100K won their way in to the tournament via one of the three Friday $100 satellites. 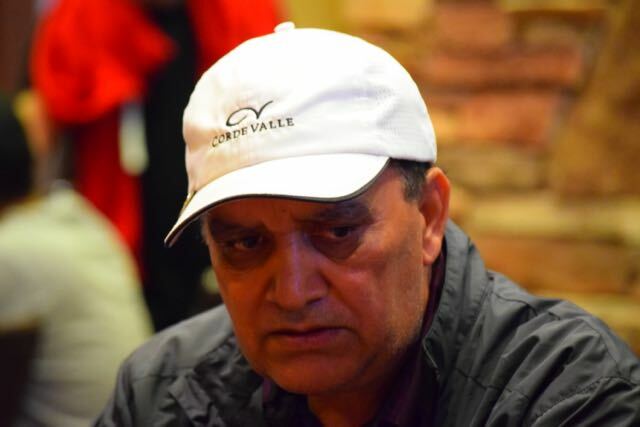 Vikram Bhatia - 8th place today - made it in via a $100 satty, turning his $100 in to $3,625. 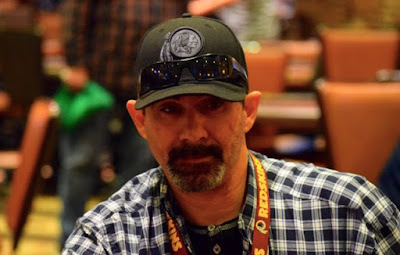 Barry Birdwell, Al Sanchez and Debbie Kenoyer are all three still in the hunt for the $27k top prize with 7 remaining. Barry Birdwell moves all in UTG - into the BB of chipleader Dan McGee - for Birdwell's last 8BB. McGee Makes the call and we're off to the flop. Both players hit the flop, a T for Birdwell, a 4 for McGee on the K-T-4 flop. 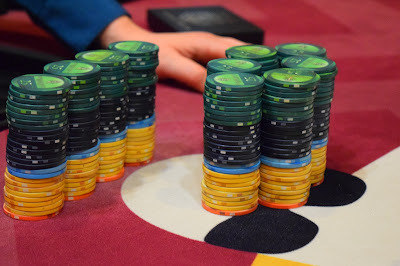 No help for McGee on the turn or river, and Birdwell chips up to 550,000. 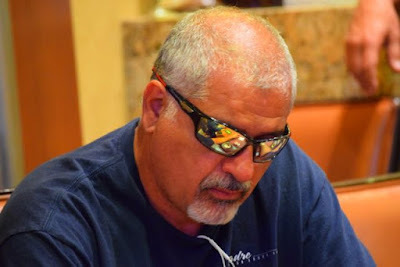 Debbie Kenoyer raises preflop, Vikram Bhatia moves all in for his last 200,000, Dan McGee and the rest get out of the way and Kenoyer makes the call. The board misses both players, Kenoyer's Q kicker playing and she moves to 1,000,000 while Bhatia is eliminated in 8th place, cashing for $3,625. The steamroller that is McGee keeps saying after flop, turn and river "I'm ahead," as he mucked 22 to the 3-bet all-in. That would have been a doubleKO for McGee, leaving him with almost 70 percent of all the chips 6-handed. 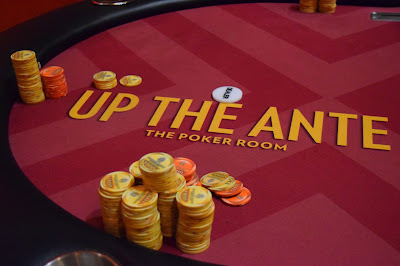 Down to the final 9 players in the OneDay $100K and here's how the final table stacks up, in seat POsition order, with chipcounts and BB's remaining. 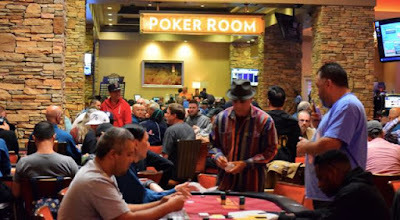 The frenetic pace slowed once the field reached 16 players, but once Sergio Vargas was eliminated in 16th, well, the race-to-the-rail began once again, and Dan McGee was the responsible party. He eliminated Candida Ross-Powers in 15th, Jasthi Kumar in 14th and Alvin Warren in 13th - all within a single orbit - and McGee has a massive 1,650,000 stack. There's only 5,565,000 total in play among the 12 remaining - or 3,915,00 divided among the other 11. Dan McGee and Candida Ross-Powers are back at it again, a few hands after Ross-Powers shoved on a raise from chipleader-McGee. This time there's a preflop raise, a reraise a shove and a call. Here's the next batch of payouts in today's OneDay$100k, as players seemed to be in a hurry to get to the rail for quite a while there. Play has slowed considerably since reaching two 8-handed tables. 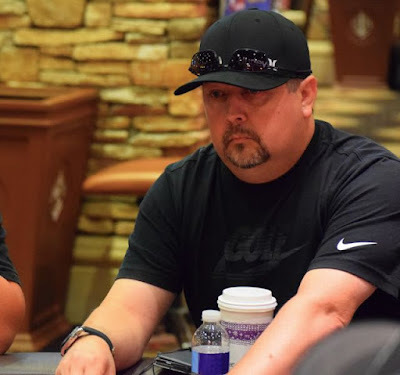 Dan McGee opens for 55,000 - as he's been doing a lot since taking the chiplead some 30 minutes ago - but this time it is Candida Ross-Powers on McGee's immediate left who ships her 25BB stack, and McGee tanks as he decides whether to risk half his stack. McGee finds a fold, Ross-Powers shows to only McGee, then others ask and her 66 is tabled. The look on McGee's face says he had two overs (AJ?). 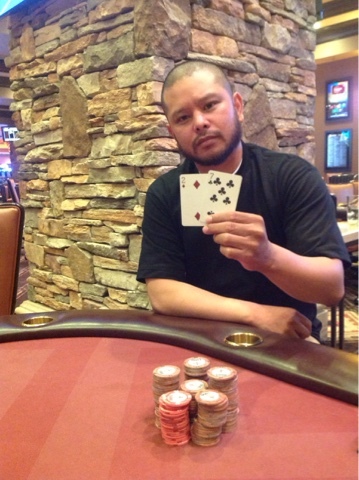 Sergio Vargas moves all in preflop for his last 9BB and is called by the bigger stacked Paul Moore. With a chant from Vargas of "Ten," for each action by the dealer, the board runs out 8-9-2-9-3 and Vargas earns his double. 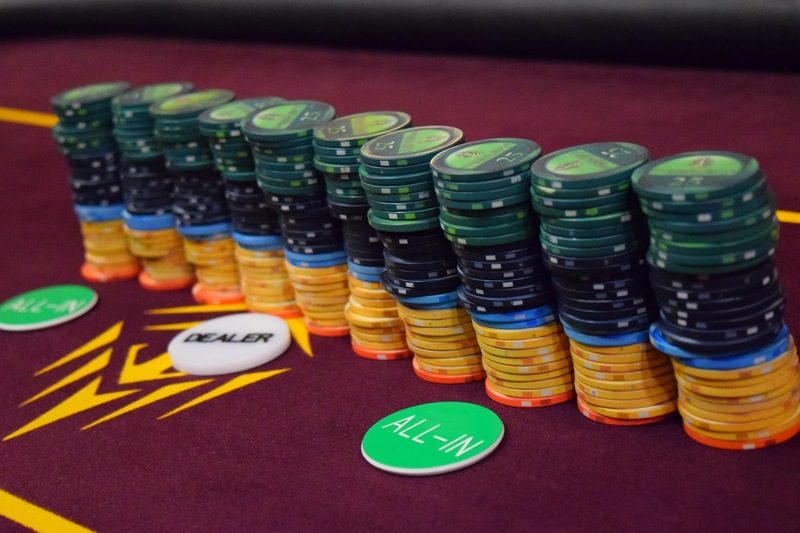 Back-to-Back bustouts for @Donna_Delfin and Dalton @PlzFold Still reduces the field to 17 and the last 2 tables of the night. Down to 19 players, and here are their chipcounts as they return from a break and start Level 21 - blinds of 8000/16000 with 200 antes. Fathers Day is Sunday, but we're celebrating a day later here with our $125 Holiday Tourney. Play starts at 11am with 10,000 stacks and we're making the prize pool a guaranteed $15,000. Down to fewer than 10BB well before dinner break with more than 120 players remaining, Dan McGee slowly chipped up after his food settled, and once the money bubble burst, well, he's been on a serious heater. 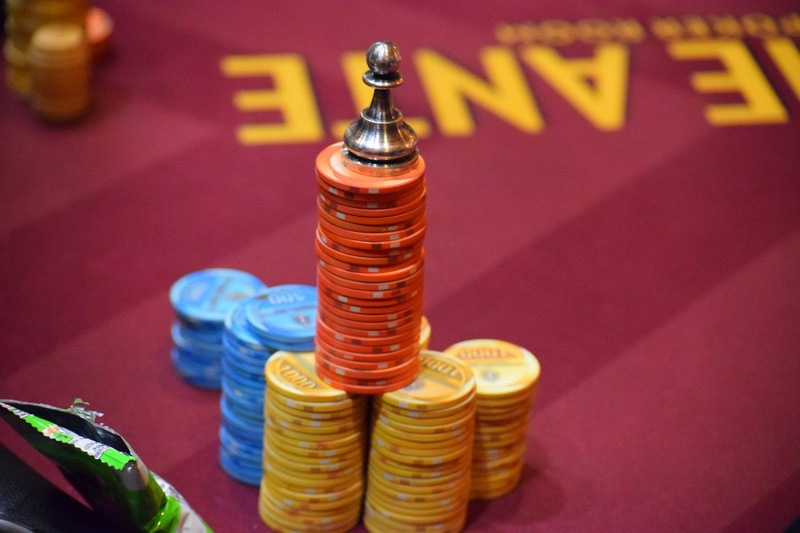 There's 19 players left now, and if not for the 775,000 sitting in front of Jasthi Kumar, it would be McGee and his 610,000 who would be chipleader. Here are the players who made it to the first pay jump in today's OneDay$100K. Down to the final three tables in today's OneDay$100K and that means it is redraw time. 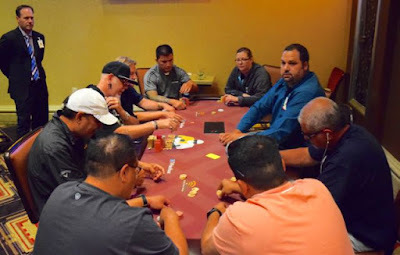 Normally I would get a list of the final 27 players - with chipcounts - before cards go back in the air, but this group moved FAST so I stayed out of the way and picked up a few counts as players unracked their chips. Two players busted before I could even get this posted, including one who ran into the AK of chipleader Jasthi Kumar, to bring the field down to 25. 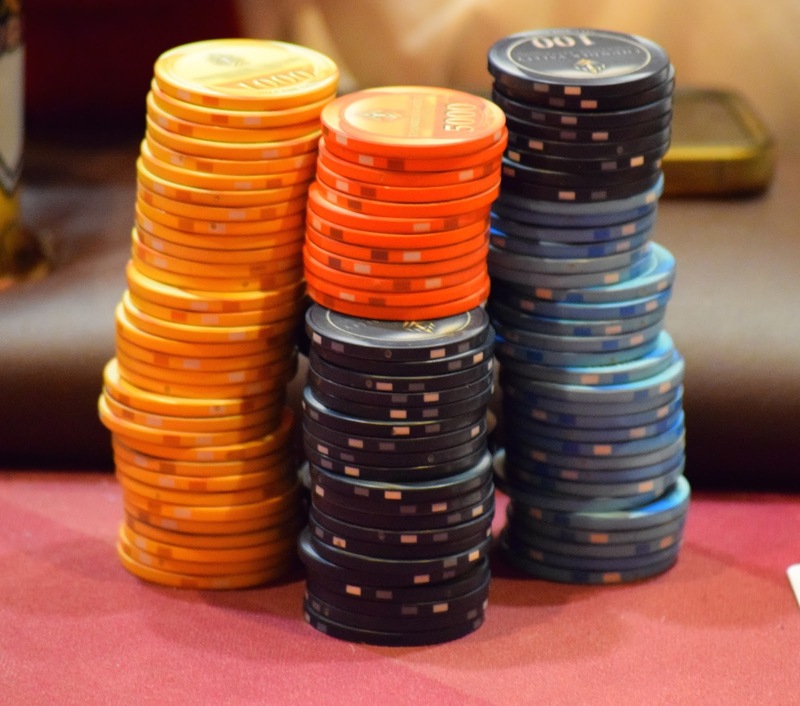 32 remain and @Jasthi_Kumar leads the way in today's OneDay$100K with a 540,000 stack. The last 'major' here at Thunder Valley was the WPTDeepStacks $1100 and Kumar was the winner, taking home $80,840 for the win 2 months ago. 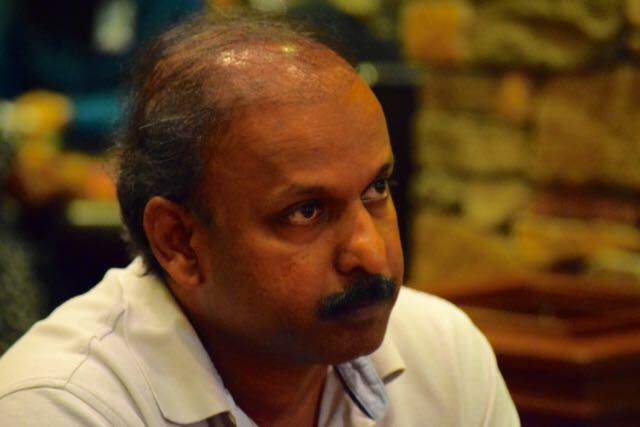 A win today would push Kumar's series tournament recorded cashes to more than $260,000. I saw Monte Gilley up at the payout counter so I stopped by to see what happened. "I had AQ UTG and a guy woke up with AK, what are ya gonna do when you're short, right?" 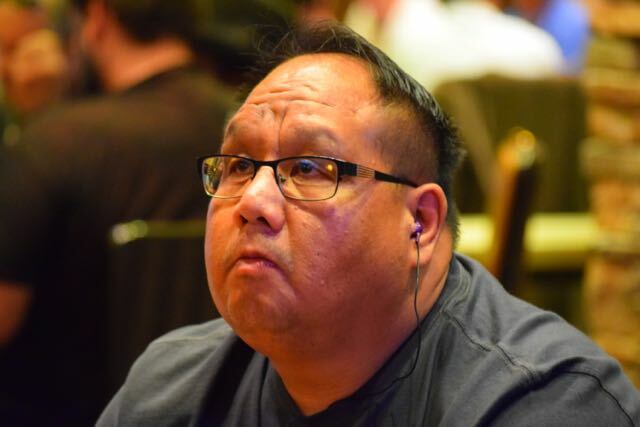 You're going to do as Gilley did, say "nice hand," finish in 37th place, pack up your gear and head over to collect as one of those who mincashed today for $725. Here's the rest of the mincashes in today's OneDay$100K. Down to 42 players in today's OneDay$100k and the remaining field went on a quick break. I had a chance to spend time talking with chipleader Candida Ross-Powers during the break. 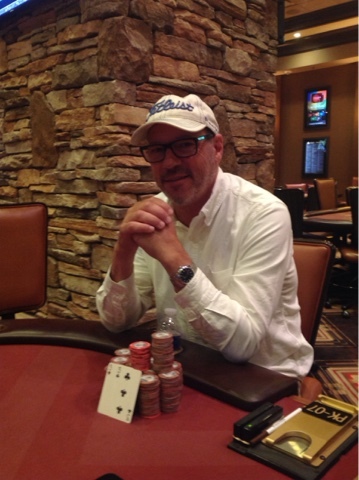 Ross-Powers took down the First Saturday tournament in May, cashing for $12,183 in the $300 buy-in with a $40,000 guarantee. She said she was a bit tired by the time that wrapped up about 2am, and she was unable to turn her brain off enough to settle and sleep by 5am! She has a number of good-sized cashes to her name, including a 5th place in the 2012 WSOP Ladies Event for $35,000 - her largest cash-to-date - as part of her more than $100,000 in recorded career tournament winnings. Her poker bankroll comes form tournaments, she says, as she's not a cash game player here at Thunder Valley or anywhere else. A social worker who investigates elder abuse, Ross-Powers says she's nearing retirement, so I'd guess you can prepare to see here much more often at the poker table in the near future. Here is the full payout structure for today's OneDay$100K. The flop is J♣️ 6♣️ 7♠️ and Bee Lee calls the all-in of the shorter-stacked player on the money bubble. All the other tables finish up, and it is time to show the hands. No more clubs on the turn or river and Lee - who was all in for his lat 8BB just two players from the money - busts the bubble and now has almost 35BB. 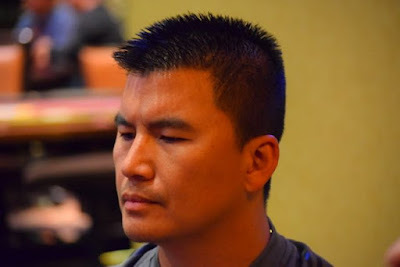 All-in preflop for his last 34,000 (8BB), Bee Lee finds three callers in Dalton Still, Greg 'Spartacus' Pincombe and chipleader Candida Ross-Powers. The flop is 5♠️ 4♠️ 6,♦️ Still and Pincombe check, and Ross-Powers slides out enough chips to put the other two players all in. Still struggles to find a fold, but manages it, as does Pincombe. Both players have overpairs to the board, while Ross-Powers also has a gutshot straight. The board blanks, however, and Lee goes from 34,000 up to 143,000 (with blinds and antes) just two away from the money. Still says he paid down 99, and Pincombe 33. The new chipleader with 50 left, Candida Ross-Powers just chalked up another knockout when a player with just 7BB shoved from UTG. Everyone else folded, but Ross-Powers did the math and saw it was only 7 percent of her stack for a call, so she slid a stack out and turned over Q♦️ 9♦️. She was up against two black 7's. The flop was massive for her, T♦️ 9♣️ 4♦️, bottom pair and a flush draw. The A♦️ turn closed it out, and the 2♦️ just reaffirmed the knockout. Powers is now the only player with more than 400,000 and we are 5 from the money. 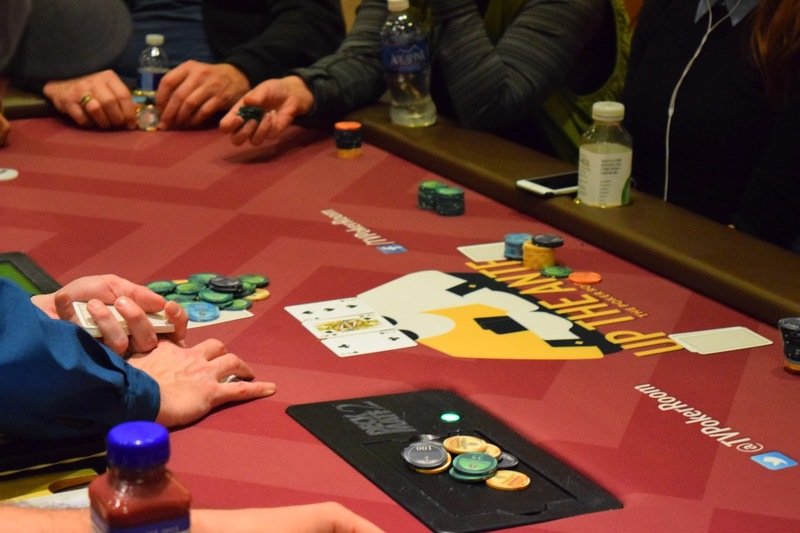 Action folds preflop to the cutoff, who ships his last 11BB. 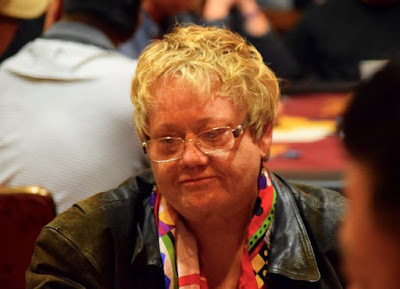 Candida Ross-Powers adds another 100,000 from the button, and Daniel Evans goes into the tank in the BB, as the call will be for 70 percent of his stack - aka it is a shove-or-fold for him. Evans finds a fold, the cutoff sheepishly turns over 5♥️ T♥️ and starts heading for the exits as Ross-Powers shows AA. The flop is K-7-8, prompting Evans to let everyone know he laid down "a suited AK." Ross-Powers moves to 355,000 and 2nd in chips with 55 left. 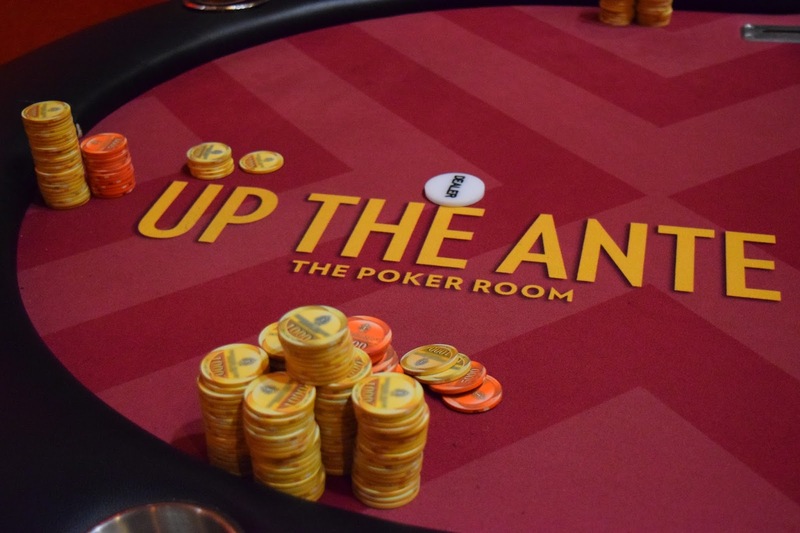 With 63 players remaining in the OneDay$100K we are now 2 tables to the money as 46 players cash today. The mincash is $725, and the top prize today is $27,190 - or 68xROI. The 65 remaining players are on a 45-minute dinner break, and here's some chipcounts from across the room. If there's a delay in reporting after break, its because only 24 minutes are left and I am finally off to dinner now. 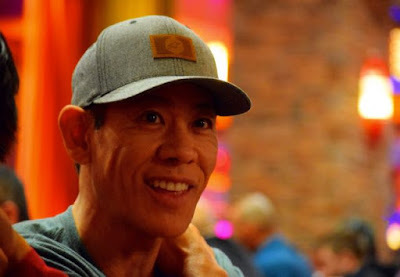 With 470,000 in front of him, Lou Saechao is the overwhelming chipleader in the OneDay$100K as we approach dinner break. We can take a pretty educated guess here and say the majority of that stack came from a clash between Saechao and Chris Hinchcliffe, as the latter exclaimed, "Not sure I've ever lost a 450k pot with avg stack at 68k, but now I have." 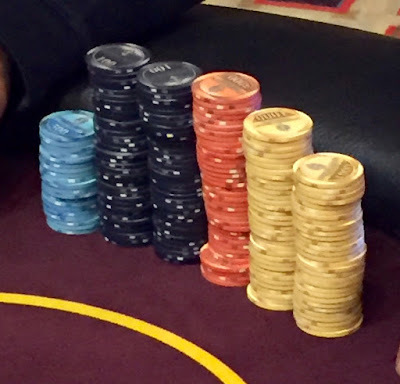 We'll have more chipcounts for y'all when players take their 45-minute break here in a few minutes. The flop is 4♠️ 7♦️ 8♦️, Candida Ross-Powers check, the BB makes it 13,000 into a 19,000 pot, and the player in the 3 seat ships it for 34,400 total. Ross-Powers asks for the count, then slides out enough to cover the All-in and put the BB player in also, drawing a snap-fold from the BB. Ross-Powers turns over a ♦️ flush draw and sees she is up against TT. She completes her draw when the A♦️ hits the turn and the other player is eliminated. Ross-Powers offers her hand to the other player, who turns his back and walks away, thus we decide not to follow to get his name. Down to 90 players in the OneDay$100K and 45 make the money, so if you're still in the tourney you have a 50/50 shot of making the money. There is a 45-minute dinner break coming at the end of Level 14 - at 6:35pm - for those at the tables whose stomachs are beginning to growl and are asking, "Hey Ma, Where's the Meatloaf?" 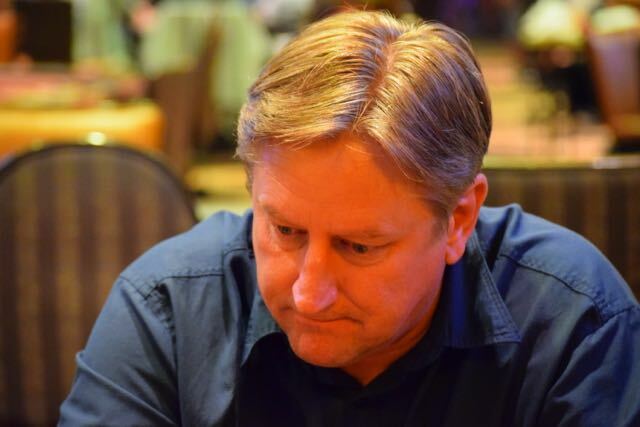 Kelly Douglas raised to 2600 UTG, the next player to act bumped it to 6000, Douglas jammed and drew a snap-call. The flop is J-high and David Covarrubias from @TurlockPoker entices a shove from his opponent (dangit, I know the guy's name but I can't think of it right now). 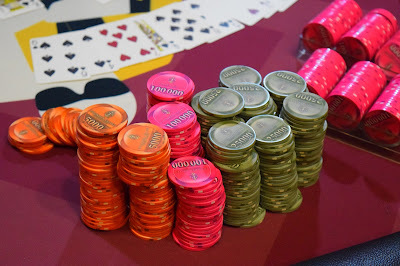 Covarrubias shows JJ for top set, while Mr Unknown turns over 99, and Covarrubias takes one of the biggest pots we've seen so far in the tournament, moving to 141,000 and one of the top stacks in the room, if not the overall chiplead. The flop is 3♠️ 4♣️ 9♠️ and floor is called over for the hand between Surinder Singh and Candida Ross-Powers because Ross-Powers moved all-in out of turn. A) to check would mean the all-in bet stands. B) bet and Ross-Powers pulls her stack back and can bet anything she chooses. C) fold and the hand is over. Singh chooses to bet, Ross-Powers opts to push her stack in, and Singh calls off his stack. Ross-Powers calls for an A or a spade. She gets half of her request when the turn is 6♠️, and she calls for the fourth spade on the river. The dealer obliges as he peels off 4♠️, eliminating Singh. "I didn't deserve that, but I'll take it," she says. - With $27,190 up top, here's the full OneDay$100K PayTable. While @Donna_Delfin did win her way in via a $100 satellite to the OneDay$100K, it feels just as bad to bust with a satellite entry as it does a full buy-in, especially when, well, we'll let her briefly state her case in 140 or fewer characters. With @DeegPoker player Nick Wooderson also in the pot, Sean Drake bets out 3500 on a K♥️ A♠️ Q♦️ 2♦️ J♦️ board. Wooderson hesitates, and makes the call. Drake shows A♥️ T♠️, Wooderson shows an A and mucks to the river broadway.